Join us for a special C-Suite Speaker Series event to kick off National Small Business Week! 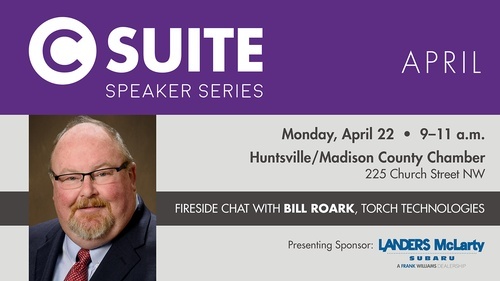 C-Suite is a fantastic opportunity to network with key decision makers within our community, and hear their take on a wide variety of topics designed to build awareness, foster understanding, and spark conversation. Most recently, in 2018, Great Place to Work and Fortune magazine named Torch one of the country's Best Workplaces in Consulting & Professional Services, as well as a Best Medium Workplace, both for the third consecutive year. Great Place to Work and Fortune magazine also named Torch one of the country's Best Workplaces for Millennials in 2018. Torch was also recognized as the 2018 ESOP (Employee Stock Ownership Plan) Company of the Year by the New South Chapter of The ESOP Association. Additionally, Torch was named a winner of the 2018 Best Places to Work in Huntsville award, marking the company's fifth time to receive this honor. Washington Technology also listed Torch in its annual “Top 100” Government Contractors ranking for the fourth consecutive year in 2018. Bloomberg Government listed Torch in its annual “Top 200” ranking for the second consecutive year in 2018. Torch was also ranked on the Entrepreneur 360 list for the second consecutive year in 2018. In 2016, Torch was named one of America’s Best Small Companies by Forbes. In 2015, Torch won the Better Business Bureau’s Torch Award for Business Ethics in the North Alabama Region for the 3rd time. Roark considers employee relations and benefits one of the most important aspects of business management, and he has worked diligently to ensure top benefits and working conditions, resulting in national recognition by The Principal Financial Group as one of The Principal 10 Best Companies for Employee Financial Security, as well as recognition by Inc. Magazine and Winning Workplaces as a Top Small Company. Before founding Torch Technologies, Roark worked for Camber Corporation as a Senior Vice President. Prior to joining Camber, Roark was with Nichols Research Corporation, at which he worked his way up from an entry level scientist position to become the President of the Criminal Justice Systems Operations Segment. Roark earned an M.S. in Physics from the University of Kentucky and a B.S. in Mathematics from Cumberland College. Pastries and coffee will be provided.